Come aboard Solar Heritage, our solar powered catamaran and take a trip through this Area of Outstanding Natural Beauty. The engines are virtually silent so you can glide along, admire the view and get up close to many of the birds and habitats that make this place so special. 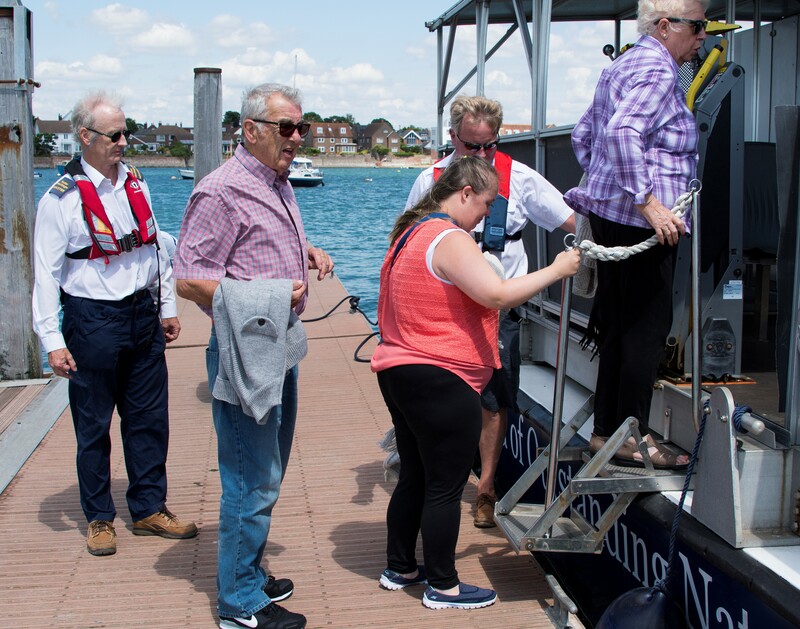 There will be an experienced guide on board to help you understand the special environment of Chichester Harbour. Download a timetable of all the scheduled trips here, information on individual trips can also be found on the What's on page. If the weather forecast is bad please check that the trip is still running by checking the events calendar on this website or phone 01243 513275 before turning up. Please book in advance online or find the date you want from the What's on page and you can book from there online or you can phone 01243 513275. From Itchenor - Bookings close three hours before the sailing. A child is up to 16 years of age (children under 2 years are free of charge - please phone the office to book as we are limited to 50 people and must account for all passengers). From Emsworth - Book in advance, but some tickets may be available to buy on the boat on the day depending on bookings. Please note cash and cheques only accepted on the boat. We now offer a special group booking discount - please contact the Harbour Office for details. ​Refunds - If we have to cancel a trip due to weather conditions, we will refund your fare in full. We are unable to offer a refund if you cancel your trip. Itchenor - Leave the A27 at the Stockbridge roundabout, taking the A286 towards the Witterings, then follow signs to Itchenor. Meet on the viewing platform in front of the Harbour Office at the end of the road, West Itchenor, 15 minutes before departure time. Parking is available in the pay and display car park signposted just before the Ship Inn. The boat will depart from the public jetty. Download a map and directions here. Emsworth - Meet on the sea wall at the top of the public jetty from where Solar Heritage departs. Please wait next to the 'Queue here until called' sign, 15 minutes before departure time. There are pay and display car parks in South Street and North Street and free parking in Bridge Road car park. Download and map and directions here. Solar Heritage is open sided so dress for the weather conditions. It is always colder on the water, even on sunny days, so it's a good idea to bring and extra layer. Tea, coffee and biscuits are available for a donation to our Get Afloat fund - please see below. You are welcome to bring your own refreshments. Please use plastic glasses or similar. No dogs please, except guide dogs. Solar Heritage has a wheelchair lift to allow easy access to the boat and the deck is level and spacious. Please let us know in advance if you will need to use the lift so we can allow adequate time for boarding. Why not bring your club, community group or group of friends for a unique trip aboard Solar Heritage. The boat can be booked by groups with trips arranged to suit your particular interest. An experienced guide will be on board to help you learn more about this special area. Trips for up to 50 people can be booked from either Itchenor or Emsworth depending on where the boat is currently stationed. From Itchenor the charge is £275 for up to 50 people on a 1.5 hour trip. This is payable in advance. From Emsworth the charge is £275 for up to 50 people on a 1 hour trip. This is payable in advance. It is worth noting there are very few private trips available from Emsworth due to the limitations of tide, and the busy public schedule. To discuss your requirements please call the Solar Boat Booking Line on 01243 513275. A trip can either be booked on its own or as part of a day spent in the Harbour with the Harbour Education Service. An experienced teacher will be on board and the focus of the trip will be planned in advance to make sure the students get the most from the visit. The boat and crew have been fully certified by the Maritime and Coastguard Agency to ensure that we are providing the highest level of safety whilst on board. Please contact the Harbour Education Service who will be pleased to provide more information. The Get Afloat! 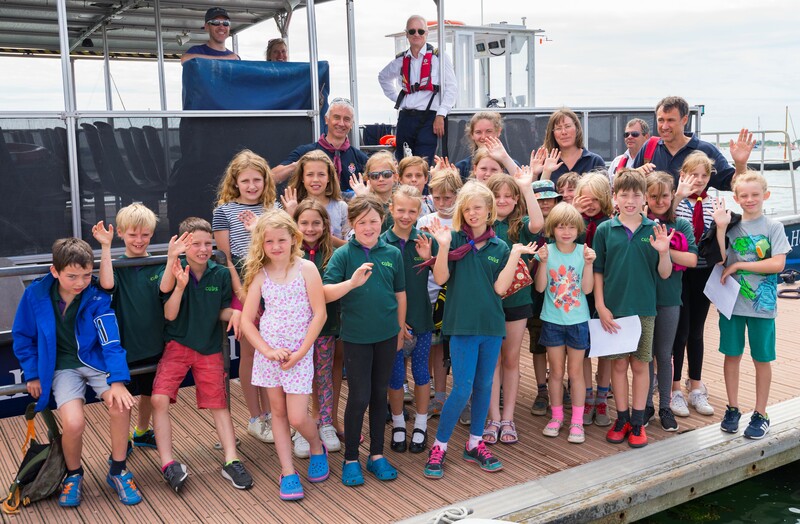 Fund helps disadvantaged children and adults to Get Afloat in Chichester Harbour on Solar Heritage by providing free trips for schools and groups. If you think your group could benefit from the Fund please contact the Education Team. If you are interested in donating to the Fund please contact the Harbour Office. Solar Heritage is an Aquabus C60, a pollution-free, solar-powered catamaran that can reach 11 knots while transporting 60 people. However in Chichester Harbour we are licensed to carry a maximum of 50 passengers and speed is restricted to 8 knots. Solar Heritage began life as one of three solar powered ferries operating out of Neuchatel in Switzerland's Three Lakes Region (Les Trois Lacs), the area that hosted the Swiss 2002 National Exposition devoted to Nature and Technology. The three ferries carried people to and from one of the exhibitions in mid lake, on a continuous basis for six months between May and October 2002. The exhibition hosting the Solar ferries was devoted to Alternative Energy, and part of the reason for obtaining a solar powered boat by Chichester Harbour Conservancy was to heighten local awareness and interest in these matters. The vessel has two sources of energy – electromagnetic energy from the sun and conventional energy from the National Grid. Questions are asked regarding operation in cloudy conditions. MW Lines have tested their vessel at night and have found it will even pick up an electric charge from moonlight! MW Lines, the Swiss manufacturer, specialise in designing solar powered vessels and vehicles, used in different countries round Europe. The vessel is driven by two electric motors, one in each hull. Both have their own independent propeller and rudder linked to the same steering in the wheelhouse. Solar Heritage arrived in Itchenor in May 2004, after a 24 hour drive across Europe on three articulated lorries. On arrival she was reconstructed at Northshore Ltd by her Swiss engineers, brought over especially for the occasion. No wash as a result of the twin hull configuration therefore reduced salt marsh and estuary bank erosion.